Do I Need A Fast VPN? Choosing a VPN service that'll keep your online traffic secure and private while providing enough speed for your preferred activities can be more than challenging, especially without any previous experience. In order to help you make the best possible decision for your needs, we created this all-encompassing guide on the fastest VPN services of 2019, which met all of our rigorous ranking criteria and have proven track records with millions of satisfied customers worldwide. ExpressVPN is one of the best and fastest VPN services on the market. The company is located in the British Virgin Islands and is well-known by millions of users for its incredible speed output. NordVPN is a Panama-based VPN provider founded in 2012. Apart from its excellent location, it offers a wide variety of features aimed to provide its users with ultimate security without sacrificing speed. CyberGhost is a Romania-based VPN provider with a huge server network that promises excellent speeds, smooth performance, high security, and safe and fast P2P sharing. It offers specialized VPN profiles to satisfy your speed needs. PureVPN is a respectable VPN provider based in Hong Kong and best known for its incredible price-to-value ratio. The company offers smooth and streamlined software, alongside many useful features for all VPN users. IPVanish is one of the premier VPN providers registered in Orlando, Florida. The company is best known for owning and managing its infrastructure without any subcontracted service companies. Although privacy and security are by far the most important aspects of any VPN service, speed is also a crucial element, not just for streaming and torrenting but maintaining the overall functionality of your computer, too. Streaming is the fastest way to access online-based content without downloading it. Unlike progressive downloading, streaming allows you to use online content before you download the entire file. For example, when you start streaming a song from Spotify or Apple Music, you can listen to it almost immediately after clicking the “play” button. In other words, you don’t have to download the entire song in order to play it, which is one of the main advantages of streaming. Another major benefit of streaming content online is the fact that it’s not permanently stored on your computer once you’re done with it. Unless you intentionally save something for offline usage, the streamed content data will automatically be deleted after you’re done using it. Streaming, however, requires a high-speed connection. The speed needed depends on the type of the streamed media. For example, if you want to stream standard definition videos without any buffering delays or skips, you’ll need a speed of more than 2Mbps. HD and 4K content will require at least 5Mbps and 9Mbps, respectively, for flawless delivery. Streaming is designed to deliver data fast, so it cannot work properly if your Internet connection is interrupted or slow. The most common error you are likely to experience is slow content buffering. You can view the buffer as a program’s temporary memory for your streamed content. For example, if you’re watching a movie, the buffer will store a couple of minutes of video in advance while you’re watching. If your Internet connection is inadequate, the buffer won’t be able to fill up quickly enough and your stream will either stop or reduce the quality of the video/audio to compensate for the lack of buffering speed. People tend to use the terms ‘BitTorrent’ and ‘torrent’ synonymously, but they actually aren’t the same thing. A torrent is simply a file that holds metadata about the content you’re about to download. BitTorrent, on the other hand, is a term used to denote a file transfer protocol that breaks down large parts of shared files into smaller pieces. Apart from the overall health of the torrent in question and the number of seeders/leechers, your Internet connection speed is crucial for quick and effortless downloads. On top of that, ISPs have been known to throttle bandwidth once they detect torrenting, so having a higher connection speed definitely helps. The short answer is, yes, of course. In order to get the most out of your Internet experience, a decent speed is not only recommended but also required. Having a fast VPN will benefit you in two main ways. First of all, it’ll allow you to use online services and download content effectively and without frustration. Secondly, it won’t use too many resources, allowing your device to function optimally. As we already mentioned, if you’re interested in streaming audio or video content online (Kodi, Netflix, Twitch, Apple Music…), you’ll need to have a substantial connection speed in order to “pull off” HD streaming. Additionally, if you want to produce content and stream it on platforms like Twitch or YouTube, a decent upload speed will be required. Lastly, if torrenting is your game, higher speeds will allow you to download your chosen files quicker and mitigate frequent bandwidth throttles enacted by your ISP. Many users often wonder why ISPs throttle Internet connections in the first place. There are many reasons for these actions, one of which we already mentioned (torrenting). Another example relevant to our today’s topic includes ISPs that offer video streaming services, so they’ll intentionally slow down your streaming sessions linked to their competitors. Even if you don’t know what it is exactly, you’ve probably already heard about something called DPI or Deep Packet Inspection. This is a technology developed to help ISPs inspect your Internet traffic and identify activities they don’t like. This is also something VPNs are designed to protect you against, among other things. In order to comprise this list of the fastest VPN services of 2019, we tested a lot of VPNs. We’ll share our testing procedure with you so that you can test your chosen VPN as well. Download speed – This metric tells us how quickly the device receives data. If you intend on downloading large files or simply a large number of files, a decent download speed should be your priority. Download speed is also essential for streaming content online. Upload speed – This metric tells us how quickly we can send data to remote destinations. Upload speed is crucial if you want to become a streamer, take part in filesharing services or back up large quantities of data to the cloud. Ping Time – Ping is the signal that is sent from your computer through the VPN server to its destination and back again. The time it takes the signal to make this trip is called latency. Latency is expressed in milliseconds and, naturally, the lower it is, the better. Low latency is essential for real-time applications and online gaming. For example, you’ll be able to do most of the low-req stuff with 100ms latency, but you’ll need much less than that to play some demanding online titles. VPN security is inversely proportional to its speed. In other words, if you increase the security of your chosen VPN, you’ll inevitably lose some of its speed. For example, data traveling through your VPN will take longer to encrypt and decrypt if you use stronger encryption algorithms. Also, more secure connection protocols (OpenVPN, L2TP/IPSec) are slower than the less secure ones (PPTP). Although you don’t have to use the strongest security configuration available, there are certain lines that should never be crossed to increase speed. For example, we strongly recommend against using PPTP since it features known security vulnerabilities. Yes, your VPN will run faster, but that’s a price you shouldn’t be willing to pay. As for encryption, AES-128 is the minimum encryption required for your VPN to keep you safe online and ultimately do its job. Even though some reviewers claim that this level of encryption is subpar at this point, AES-128 is still effectively un-crackable and therefore perfectly capable of keeping your data away from prying eyes. Some VPN providers (not a lot of them, though) offer Blowfish encryption, which is considerably slower than AES. For lightning-fast performance, we recommend going with 448-bit Blowfish if you decide to take this route. During your quest for speed, you’ll undoubtedly encounter desktop browser extensions and iOS/Android apps that boast their capacity to speed up your VPN connection. Since there’s actually no way for a third-party app to do anything about your VPN speed (especially not for free), these apps are most likely used to serve ads or mine your data (i.e. scams). Finally, you can tweak VPN protocols and encryption all day long if your hardware can’t support the speed you want, so before you start compromising your security, you should definitely make sure your device is powerful enough to quickly encrypt and decrypt data and provide you with the speed boost you need. Contrary to popular belief, there’s no such thing as the fastest VPN. The speed of a VPN depends on numerous factors, including your original Internet speed and personal preferences and expectations. For example, if you mostly browse text-based sites, pretty much every VPN will dish out enough speed for you to catch the latest news. Streaming, on the other hand, requires a lot more power. Also, if your Internet speed is slow, you can’t really expect reasonable VPN speeds, no matter what you do. For optimal VPN speeds, you’ll want to connect to a VPN server that’s geographically close to you. Higher mileage between the VPN server and your computer will increase the overall complexity of the Internet traffic, decreasing your VPN speed. Unless you need to connect to a particular VPN location in order to bypass Internet blocking, you should always choose a VPN server that’s closest to you. Even if you’re trying to avoid censorship or connect to online services with geo-blocking, you should connect to a server in the closest region or country. For example, if you’re currently in China, you would probably want to connect to a server in Japan. Also, if you want to connect to a US server from China, you should avoid VPN servers on the East Coast and go for those located on the West Coast (such as San Francisco or Los Angeles). This is why we searched for VPN services with large server networks that’ll allow users all around the world to find servers that are not just close to them but also ensure optimal speed. VPN connection protocols are crucial when it comes to online security, but they can also hinder your connection speed significantly. In other words, different VPN protocols result in different VPN speeds. For example, OpenVPN UDP is faster than OpenVPN TCP, L2TP is slower than OpenVPN, IKEv2 is faster than L2TP, SSTP, and PPTP, SSTP has a better encryption/speed ratio for torrenting than OpenVPN, etc. If you’re not happy with your current speed, you might want to experiment with different VPN protocols and see if you can give your VPN speed some boost. Additionally, if you live in countries such as China, which is infamous for blocking VPN traffic, you should opt for a VPN service that offers protocols like StealthVPN that will help you bypass the implemented blocking measures. When choosing the fastest VPN services of 2019, we made sure to include only the ones that support a wide range of connection protocols, allowing you to tinker with different settings and increase speed. The general rule of thumb is that higher encryption strength results in slower VPN speeds, so encryption with 128-bit keys will make for a faster VPN than the one with 256-bit keys. In other words, you can play around with weaker encryptions if you want to boost your VPN connection speed. Additionally, you can also try out different connection protocols since they don’t feature the same encryption level. For example, PPTP and L2TP/IPSec utilize a weaker encryption level (128-bit) than OpenVPN (256-bit). Our list features VPN services that offer numerous connection protocols, which allows you to customize your VPN settings for optimal speed. Note that lowering your encryption level makes you more vulnerable to online attacks, so make sure you exercise proper caution when playing around with these settings. For example, you can weaken your encryption when visiting trusted sites but definitely shouldn’t expose yourself in this way when browsing questionable online services. Weaker encryption also puts less strain on your CPU processing resources, which improves the performance of your device. Our list of the fastest VPN services of 2019 features only providers with wide networks of powerful VPN servers. When we say ‘powerful,’ we refer to the overall bandwidth available to the customers. Therefore, we included only services with unlimited bandwidth, server switching, and speed. Additionally, the overall server load is very important when it comes to VPN speed. In other words, the more connected users, the lower the server speed. This is where the number of servers offered by a VPN comes into play. If a company features a large number of servers spread all over the world, it gives you greater chances of connecting to one that’s not overcrowded. We have to mention that this problem most commonly occurs with free VPN services, though. Certain countries (China, for example) feature ISPs that actively interrupt or block VPN connections. Needless to say, these actions can severely compromise your VPN speed. This is why we made sure our list of the fastest VPN services of 2019 features only platforms that work in China and can help you bypass all anti-VPN measures put in place by the government and its agencies. Our goal is to help you find the fastest VPN that suits both your needs and your budget. What follows is a complete overview of the pricing options offered by VPN solutions that made it to our top list. Browse the table below and discover how our top picks compare to one another in terms of affordability. We have chosen the fastest VPN services that satisfy all of our selection criteria. Now it is time to explore our top picks in greater detail and find out which one is the best fit for you. Read the mini-reviews below, discover the key features of our top-rated fast VPN services, and decide which one is the right match for your needs. ExpressVPN is one of the top VPN providers on the market located in the British Virgin Islands and famous for its incredible output when it comes to raw speed. ExpressVPN offers more than 1,500 VPN servers in 94 countries, which gives a lot more reach to potential users from the distant corners of the world. The company allows up to 3 simultaneous connections. Supported connection protocols include OpenVPN, L2TP/IPSec, PPTP, and SSTP, which provides you with a lot of possibilities to play around with different settings for optimal speed. ExpressVPN offers the flawless AES-256 encryption and even a smart DNS service, which further helps you resolve any speed issues you might have. Smart DNS means no encryption/decryption shenanigans, which translates to fewer buffering issues. The bandwidth and server speeds are unlimited and the company also allows P2P traffic. 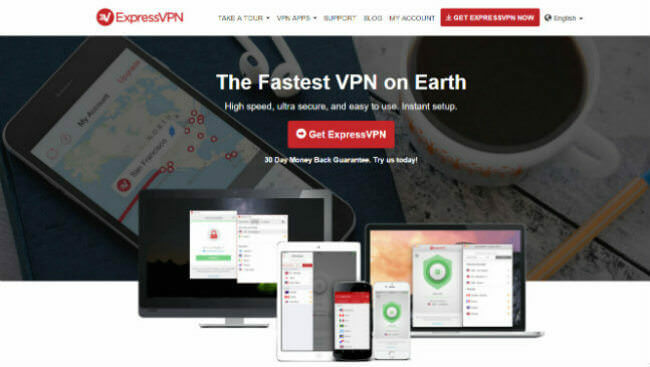 Lastly, ExpressVPN can bypass Chinese VPN-blocking measures and allow Chinese users to keep their online sessions secure and private without sacrificing their connection speed. NordVPN is a VPN provider founded back in 2012 in Panama, which is a premier location for all VPN users. The company features more than 3,500 servers spread across 61 countries, which is a huge network ensuring none of the servers are overcrowded at any given point. It also supports up to 6 simultaneous connections. When it comes to connection protocols, NordVPN supports OpenVPN, L2TP, IPSec, and PPTP, so you’ll have plenty of room to experiment with the best speed-security ratio. The implemented encryption is AES-256 cipher with RSA-2048 handshake and HMAC SHA-1 authentication. NordVPN also offers unlimited bandwidth and speed, supports P2P traffic, and can’t be detected (and blacklisted) by Netflix. On top of all this, NordVPN can’t be stopped by Chinese anti-VPN security measures, which means you can use it to bypass censorship without any fear of losing your VPN speed. CyberGhost is a Romanian VPN provider that boasts more than 2,400 servers in over 60 world countries, with its server network growing at a steady rate. With such a vast network and server speed of up to 600 Mbps, there is virtually no chance of overcrowding. The service allows as many as 7 simultaneous connections. You can choose from OpenVPN, PPTP, and L2TP/IPSec protocols, which allows you to customize your experience in accordance with your safety and speed preferences. Furthermore, you can choose from a variety of VPN profiles designed for different user needs, including profiles particularly designed for surfing, streaming, and torrenting. You can get an additional speed boost with CyberGhost’s Extra Speed feature. It is worth noting that the service offers unlimited bandwidth, speed, and server switching. With a strict no-logging policy, military-grade 256-bit AES encryption, DNS and IPv6 leak protection, Bitcoin as a payment option, and an abundance of bonus security features, including anti-fingerprinting, malware protection, anti-tracking, WiFi protection, and ad-blocker, CyberGhost is not only fast but incredibly secure, allowing you to enjoy maximum protection and anonymity along with above-average speeds. PureVPN is a well-known VPN provider based in Hong Kong that truly offers a lot for the money invested, starting with fantastic software and moving on to many other useful features. PureVPN offers around 750 VPN servers spread across 121 countries, which guarantees you will have a high-quality server near you at all times. 5 simultaneous connections are supported at this point. The company supports OpenVPN, PPTP, SSTP, L2TP/IPsec, and IKEv2 connection protocols, giving you plenty of room to tweak your VPN connection for ultimate speed. PureVPN implements 256-bit data encryption and offers more than 88,000 different IPs, which makes it almost impossible for online services to positively identify you. You can also go for a dedicated IP add-on if you frequently use geo-restricted online platforms like Netflix, Hulu or BBC iPlayer. The company features unlimited bandwidth, service switching, and speed. It also allows P2P filesharing and works perfectly in China, so you don’t have to worry about government agencies and ISPs recognizing your VPN traffic and trying to hinder or slow it down in any way. IPVanish is one of the leading VPN providers in the world. Located in Orlando, Florida, the company is famous for owning and managing its own infrastructure, which means there are no subcontracted companies involved in service delivery. IPVanish currently features more than 1,000 VPN servers located in over 60 countries all over the world, so you shouldn’t have any issues with servers that are too far away or overcrowded with users. You can also maintain up to 5 simultaneous connections. The company supports OpenVPN, PPTP, and L2TP/IPSec protocols, which may not be much in terms of sheer variety, but it offers a perfect balance between speed and security. The traffic is encrypted via AES-256 cipher. IPVanish also offers unlimited bandwidth, server switching, and speed, so you have nothing to worry about when it comes to potential speed limitations. P2P filesharing is supported. What’s more, IPVanish is fully functional in China, which will help you bypass censorship and maintain high connection speeds in spite of all efforts to block VPN traffic.